A number of our comrades signed up to distribute Poppies on Friday and Saturday, November 9 & 10 at the September Post meeting. Those of us participating in the “Veterans in the Schools” program will need to coordinate our school presentations with our Poppy schedule to avoid conflict. Sign up sheets will again be available at the Post meeting on October 18. All of our Veterans Day Events are extremely rewarding to participants. Please join us. Once again, Post 8870 members and friends will distribute Buddy Poppies at four locations, the weekend preceding Veterans Day. On Friday and Saturday, November 3 &4 , we will be at the QFC at Westgate in Edmonds, The QFC on Mukilteo Speedway and at Fred Meyer off 164th in north Lynnwood. On Saturday, November 4 and Sunday, November 5, we will have a crew at the Central Market in Mill Creek. This is, as we say in the USN, an all hands evolution. As this is being written, we are short handed at QFC Mukilteo, Fri. AM & Sat. PM and at Central market for both Sat & Sun all shifts. If you have not yet signed up, please do so at the Post meeting on October 22 or Contact Bob Crawford (email bobcrawford33@hotmail.com or phone 206-9094893) to arrange your shift. If you have already signed up, consider adding another shift to your schedule at either Mukilteo or Mill Creek. Your Commander will be at QFC in Mukilteo on Friday and at Central Market on Saturday and Sunday and would love to see you at either location. The Post veterans relief and community programs are funded entirely from donations received in conjunction with our semi annual distribution of “ Buddy Poppies” around the Veterans Day and Memorial Day observances. Our Post Chaplain, Dan Doyle and the Relief Committee he chairs, which includes Jim Blossey, Carl Kurfuss, and Rose Gilliland, have prepared the following proposed budget for the current fiscal year, to be voted on at this month’s meeting. 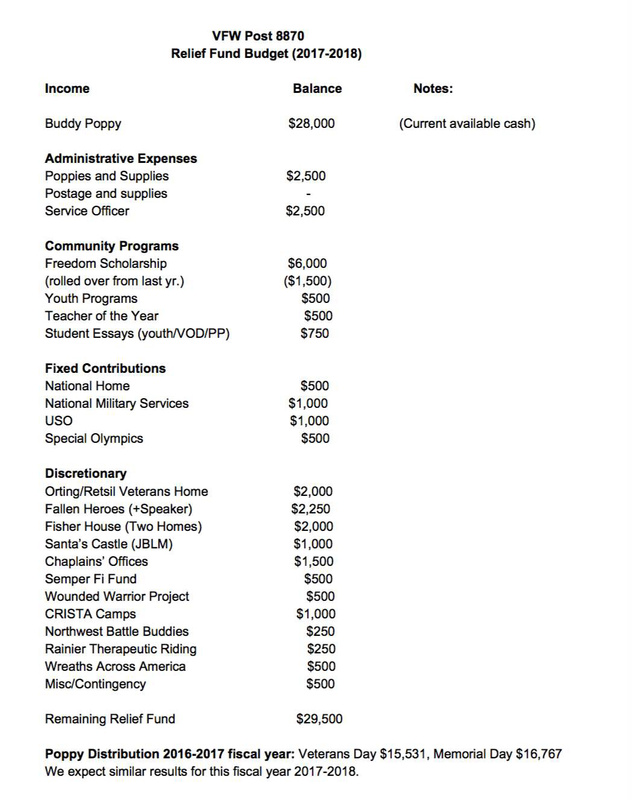 Remember that your donation is tax deductible and, better, not a single penny of our Relief Fund is used for administrative expenses with the exception of the purchase of Poppies which are made by veterans here in Washington State. 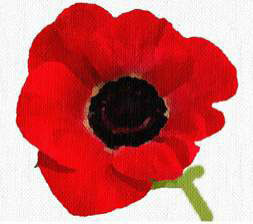 We’d love to have your company when we distribute Poppies but your generous donation will be equally appreciated. When I first became active in VFW, I was very hesitant to volunteer handing out Poppies on Veterans Day and Memorial Day. I overcame my reluctance when the Poppy Chairman one year almost broke my arm to get me to sign up for a shift. Since then, I don’t believe I’ve missed a single Poppy drive. Why? Because it isn’t like having a root canal, in fact, it is a very satisfying experience. Folks are down right friendly to us and you end up meeting some very interesting folks. In the past, I’ve met a woman who served in the German Army in WWII as a radar operator and fled to the Americans at the end of the war. I’ve met veterans who have served in every war from WWII to the present and sons and daughters of veterans including one who survived the Bataan Death march. I’ve had a Korean couple thank us for saving their country and best of all, we have handed out hundreds of brochures, primarily to school children, explaining why the Poppy is a symbol of Veterans Day. We work in teams so you’re never alone and the shifts aren’t that long—typically 4 hours. All the funds we raise are dedicated to our Relief Fund and aren’t used to support the Post. So consider helping out because at the same time, you’ll really be helping out the various places we spend our funds like the NMS, Fisher Houses, and active duty military folks who need Christmas gifts for their children and can’t afford them. We will be at several stores on November 7th and 8th. If you can help (and we no longer break arms like mine was), let us know. Call Bob Crawford at 206-909-4893 or email quartermaster@vfw8870.org. We are going to be handing out Buddy Poppies at the 4th of July Fireworks at the Civic Playfield. We need 4 volunteers (2 at each table) for a couple of hours of volunteer time. If you were one of those who didn’t participate on Memorial Day weekend, here’s your chance to help out the Relief Fund. A flower that evokes the memories and emotions of war is the red poppy, which became associated with war after the publication of a poem ” In Flander’s Field”, written by Col. John McCrae of Canada. The VFW was the first veterans’ organization to adopt the poppy and develop a national distribution campaign. For more that 75 years, the VFW’s Buddy Poppy program has raised millions of dollars in support of veterans’ welfare and the well being of their dependents. Today, VFW Buddy Poppies are assembled by disabled, needy and aging veterans in VA Hospitals and domiciliaries across the country and are distributed by VFW Posts and their Ladies Auxiliaries. The minimal asessment (cost of the Buddy Poppies) to VFW units provides compensation to the veterans who assemble the poppies, provides financial assistance in maintaining state and national veterans’ rehabilitation and service programs and partially supports VFW National Home for orphans and widows of our nation’s veterans.